Heat the olive oil in a large pot or Dutch oven over medium heat. When it is shimmering, add the ground beef, pork and veal, and cook, breaking it up with a wooden spoon, until the meat is browned. Add the onion and garlic to the meat mixture and sauté, stirring occasionally, until the onions are translucent, about 7 to 10 minutes. Stir in the dried basil and season with salt and pepper. Stir in the red wine and let simmer for about 1 minute, until mostly evaporated. Reduce the heat to low and add the crushed tomatoes and tomato puree to the pot, stirring to incorporate. Reduce the heat to the lowest simmer possible, and place a lid on the pot slightly ajar. Simmer for 2 to 3 hours, stirring occasionally. I have adjusted the amount of olive oil called for in this recipe. 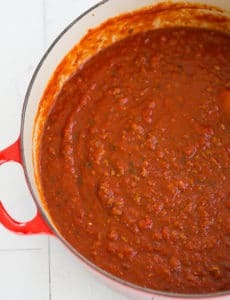 Many readers have commented that they found the sauce too oily (it originally called for 1/2 cup); after speaking with my father-in-law, I did a couple of batches with less olive oil and am now recommending 3 tablespoons (reflected in the recipe above).